Original photos in protective sleeve from Adolf Hitlers Berghof. 13 photos showing interior of the Berghof and 1 photo is showing the Berghof from outside. One of the photos show the rare view of Hitler's bowling alley. The other photos are views of the conference room with open fireplaces, tapestry room, map room with large window, living room, private studio, entrance hall w/ wardrobe, the large berghof window, dining room, the wintergarden. The publication date is not exactly known, but for sure after 1945, because the description on the back of each photo mentions, that the scene was photographed before WWII bombing / destruction. Thus I estimate that it was published shortly after the bombing. In mint, sleeve in very good. Approx/Measurements of each photo: 2-1/2" x 3-1/2". 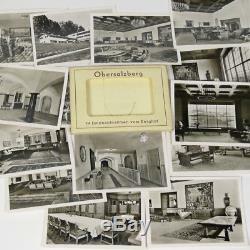 The item "14 Original German B&W Berghof Obersalzberg Photos Hitler's House Germany b WWII" is in sale since Monday, April 23, 2018. This item is in the category "Collectables\Militaria\World War II (1939-1945)\Photographs". The seller is "omosan" and is located in Bavaria. This item can be shipped to United Kingdom, North, South, or Latin America, all countries in continental Asia, Australia, Spain.